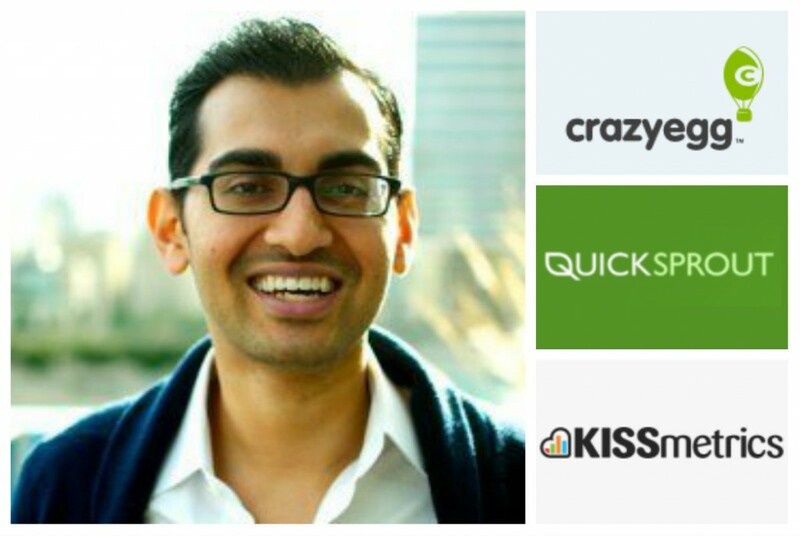 Neil Patel is the co-founder of Crazy Egg, Hello Bar, and KISSmetrics. He also has a very popular traffic generation blog called Quick Sprout. The Wall Street Journal calls him a top influencer on the web and Entrepreneur Magazine said that he has created one of the 100 most brilliant companies in the world. He's been revered as one of the top entrepreneurs by President Obama and the United Nations. Paul: Hi there software entrepreneurs and welcome to the Disruptware Podcast. This is the show for entrepreneurs who are either just starting out or those who already have a software company and looking for techniques and ideas for massively scaling their business. The way we do that is to interview experts in the market who are already running their software company and whatever level they are at they have great content to share and we dig deep to get factual experiences that you can put into action right now. My guest today is someone by the name of Neil Patel, who is the co-founder of Crazy Egg, Hello Bar, and KISSmetrics. He also runs an excellent blog called Quick Sprout, which is all about traffic generation. He's also helped companies like Amazon, MBC, GM, HP, and Viacom grow their revenue. The Wall Street Journal calls him a top influencer on the web and Entrepreneur Magazine says that he's created one of the hundred most brilliant companies in the world. Neil, welcome to the show. I'm very honored to have you here today. I'm blown away by your amazing achievements over the past few years and obviously I know what you've achieved etc., but in your own words can you just tell us a bit about yourself and your background and what you're doing now? Neil: No problem. I'm a serial entrepreneur. I like building software products for marketers and at the end of the day my current two software companies that I really enjoy spending my time on are KISSmetrics and Crazy Egg. Paul: Crazy Egg, I guess for the benefit of listeners is about tracking heatmaps, isn't? So, it's tracking sort of activity, what people are actually doing on your website. Neil: That's correct. It shows you where people are clicking and where they're not so that way you can improve the usability, your conversion rate etc. Paul: What gave you that idea? How did you actually get into that? Neil: The idea came from a collaboration of me, my co-founder and a guy by the name of Ryan Nichols, who was at that time a Project Manager, Designer. He had his own company and he later took a nine to five job somewhere else, but an awesome guy. And what we ended up finding out is when we had a marketing agency, companies were like, "We have all this traffic coming into our site, we don't understand what these visitors are doing. Why aren't we getting more conversions?" So, we tried to create a visual representation that would help solve this problem. Paul: KISSmetrics is an analytics platform but of course, you know at the time Google Analytics was really, really, big so what made you go into KISSmetrics? What gave you that impetus to do that? Neil: Yeah, so KISSmetrics is pretty much Crazy Egg 2.0 just got renamed and spun out as its own company. When we were creating Crazy Egg we had an issue, we couldn't figure out our lifetime value of our customer, our turn rate, what was causing it. We were flying blind, but yet we were trying to grow our business, so we ended up creating KISSmetrics to help companies like us track all these metrics and help improve their overall growth, in essence we're providing insights on their customers. Paul: What's the key differentiator between something like that and Google Analytics? Which when you talk to people about analytics tool that's the first they do, right? They say, "Oh, we've got Google Analytics and it's free." Neil: Google will tell you what happened on your site like how many visitors you got, etc. KISSmetrics shows you who did it and it will tell you which customers are doing what, why they're turning, what actions did they take before they turned, so it's all about getting more insights about your customers so that way you can improve the user experience and maximize your revenue at the same time. Paul: When you created this ... You had this vision and you had Crazy Egg and then Crazy Egg 2 which turned into KISSmetrics ... How did you get your first 20 customers into KISSmetrics? Neil: It was just manual outreach. We had all the things we thought would be a good fit and we offered to them to use a product for free. Paul: Are they still using it for free? Or did you then say, "Right you can only use it for certain period of time?" Neil: We said certain period of time. Some are still using it and paying and some are not. The product evolved a lot from when we first started. Paul: Did you go to like big players or people you know like influencers in the market so that you knew the word would spread? Neil: We didn't end up going to the big influencers right away. Once we had a product that we felt people would pay for we had a product market bid then we started going to the influencers and trying to get press. Paul: Really, you just wanted like anyone on the platform using it initially to get feedback, right? Neil: Correct. Anyone that would be an ideal customer. Paul: Taking that forward, how did you scale it? How did you grow from the first 20 or 50 up to ... How many have you got on the platform now? Neil: I do not know, but it's in the thousands. Paul: Right. So I guess it's that scaling stage, you know going from the first 20 or 50 up to the thousands. What was the big change there? Or how did you build that momentum to actually get all those sales on board? Neil: It's just time and marketing, right? One of the main things that we ended up doing was we looked at content marketing as a way to acquire new customers and that's one of the ways that we really were able to just grow the business, because we were continually acquiring new customers by educating the market. That's probably how the majority of the customers find us still today. Paul: Everything comes down to publishing great content and I guess you're pushing content into the community of people who are likely to use your product. Paul: You probably have to live in ... What's your target ... ideal customer? Neil: A marketer who works at a software as a service subscription or an e-commerce company and they do at least $10 Million or more in revenue a year. Paul: So you kind of need to hang out in those environments, in those communities and push out educational content to those communities. Obviously, they see you as the authority and they're learning from you and that's what then builds the leads and I guess the sales. Paul: Did you hit any initial challenges in that growth? Neil: It's always tough, right. There wasn't really any specific initial times there was just a lot of challenges and over time you overcome them and you continually grow, etc. Paul: Right. In terms of the technology, the growth of the platform, did you get it all built here or do you outsource it? Neil: Yes, it's all built in the US. Paul: In terms of scaling, do you have any challenges on that? Because a lot of people they build a product, get it out there, get some customers on and then if it takes off all of a sudden they get a bit overloaded. Neil: That's correct. You're going to struggle. You're going to make errors. You're going to make mistakes. You just have to keep adapting and learning as you're growing and you know moving fast. What are your thoughts on pricing models? Because that’s something I get a lot. People thinking, "Should I do freemium? Should I do free trial? Should I just get people to pay for it from day one?" What's your experience in that world? Neil: You have to test to see what's right for your business, because every product is different. My favorite, of course, is always freemium, because it makes the cost to acquire a new customer much more affordable. Paul: But do you face challenges then getting them to actually put their hand in the pocket? Neil: Yup, at the end of the day ... so you are saying, "Do you face challenges with the data when you're doing freemium?" Is that what you're asking? Paul: One of the challenges of freemium, of course, is you get … your customer acquisition or at least your lead acquisition is really straightforward, because you can get all these people using it for free, but the issue then is like taking that free user to a paid user. I think they call it the Penny gap or something like that. It's a different type of customer and sometimes the leap from freemium to actually paying for it is quite a challenge and I was wondering what your thoughts are on that? How can you make that really, really work? Neil: At the end of the day, it's a numbers game and you just have to continually test. A lot of people with freemium where they go wrong is they do a freemium product that isn't ... They don't try to figure out how to reduce features sets or only provide the necessities and then get people to upgrade to get the extra stuff. It's a very tricky thing when you're doing your freemium business, it's like finding the right mixtures. Paul: The trick is finding or making sure your product is so good that people fall in love with it. Paul: It's that tipping point. When you really love something you're going to tell people about it and that's what creates the growth. Paul: What are your favorite growth hacks, Neil? In fact, the growth hacks, I'm starting to loathe that word because a lot of people using it, but basically we're talking about more traffic and more customers and everything, but what are your favorite strategies around that? Neil: One of my favorite strategies is trying different things out right from referral programs to referral programs for more space or whatever it may be to like using work emails and inviting work colleagues and sharing data with them. Where you just got to really see what ends up working. A lot of times I limit feature sets and be like, "Pay with a Tweet to see the rest." So you can do some fun stuff. Paul: Pay with a Tweet? Is that a good approach? Neil: Yeah, I found that to work out really well. Paul: Can you just explain what that is as such? Neil: Like if you want to give away something and you want to charge for it, but people can't afford it you can say, "Hey, you can either pay like five bucks or you can pay with a Tweet." And a lot of people will pay with a tweet and some people won't want to tweet at all from their profile so they'll just buy it. We found out the companies are more likely to buy it, but individuals will tweet it and get it out there for you. Paul: Great. That's a really good idea actually. I guess ... Does your model have to be ... is that only going to work for the sort of really lower priced model? Or can you do that for enterprise stuff as well? Neil: You could do it for almost anything. Untitled Startup ... I'm trying to think what their company name is ... Simply Measured. They changed it. Simply Measured has an enterprise-type of account and they do have a pay with a tweet model as well. Paul: Anything else? What else do you think is really current and works right now as a good traffic strategy? Neil: Content marketing, SEO, a lot of other old stuffs still works well. Pay per click. Paul: I saw your post on Guest Posting and you know Matt Cutts put out a video about the death of what ... what people are perceiving as the death of Guest Posting, but in fact it's not really true, is it? What's your thoughts on that? Neil: At the end of the day, I think Google will penalize companies who are using Guest Posting to manipulate rankings. But what they won't do is ... I think Guest Posting is still valid especially if you get it from high authority sites and it can drive traffic, getting sales ... you just need to focus your Guest Posting efforts for acquisition versus for manipulating search engines. Paul: Focus really on ... If you take the mindset of creating a quality guest post and looking for sites that have high traffic and a high authority and view it as a traffic medium rather than the link generation medium, right? Does that make sense? Paul: In my community I've got a lot of people who are either boot-strapping or they're thinking about getting funding. What are your thoughts on that? Because there's two schools of thought and some people want to go hard-in and just get massive funding and explode and other people ... and in fact, nowadays more and more common people are really trying to do things out of their own pocket. Neil: I like the concept of trying to do stuff out of your own pocket. I've always been a big fan of that and at the end of the day you just got to do what's right for you, but if you can do something out of your pocket that's great. If you are trying to create a huge company and you need a lot of capital then you should look at investing money ... raising money not investing but raising. Paul: Did you start Crazy Egg with your own money? Neil: We did and then KISSmetrics. We were trying to make much larger at a faster pace so we raised money. Paul: Did you take, with KISSmetrics, did you go to the investor community and basically say, "This is like Crazy Egg version2," or did you sort of go in with a completely different pitch? Neil: A completely different pitch. Paul: When Crazy Egg started that must have been quite expensive to build and you had customers coming on board, how did you fund that? If you funded that out of your own pocket did you have some sort of other revenue stream or anything else coming in? Neil: We used to run a consulting agency and we were making good cash from that. Paul: Your consulting agency was...? Paul: Tell me your thoughts in terms of entrepreneurship. You are a very, very busy guy and you've got quite a few businesses now. KISSmetrics, obviously being the big SaaS one, but you run a great blog Quick Sprout and that's all about traffic generation, but with all these different businesses, how do you keep focused or how do you know what to focus on as an entrepreneur? Neil: I try to focus on one business at a time and then the main one I focus on is KISSmetrics. Paul: But I'm always impressed like when I look at Quick Sprout and someone maybe do a blog post ... is it you answering all the comments that are coming in? Paul: So you're spending a lot of time there as well and I think that's fantastic and amazing you can do that, but me when ...you know I've got like three businesses and I find it really difficult to divide my time up among those businesses and stay focused. Neil: For us, we actually get a lot of our customers for our KISSmetrics from Quick Sprout which is why it's also worth it. Paul: Right o.k., that makes sense. When you start your day apart from doing interviews with people like me, do you have some sort of ritual or how do you plan out your day so that you know what you want to achieve? Neil: I have ... pretty much have an assistant. The assistant tells me what I need to do for the day. What I try to do is like plan out my week so at least I can divide up my time, but from your perspective ... just focus on one business at a time and that's your view, right? Paul: Now, interesting, going back a bit, you know we share one thing in common in that we're both born in the UK. I haven't lost my accent though yet. Neil: And sadly, I don't have any. Paul: I was wondering where do you get your entrepreneurship or your spirit as an entrepreneur? Because I think it takes a certain individual to be an entrepreneur. It doesn't suit everyone and I relate my experience to my dad who created at least two businesses that failed before his third one was successful. I've also worked in three startups and I really admired some of the leaders and the people at that startup who you can just see the grit and the determination that they have and so I'm quite inspired by that. I was wondering with your background, what got you into this whole world? Neil: I've always known the computer space. That's all I've really known or the internet world. I grew up with it and my mom has been an entrepreneur for years so I got it from her. Both my mom and dad always encouraged me to be an entrepreneur and do whatever I want etc., so it's helped out. Paul: Where do you take your inspiration from nowadays? What blogs or thought leaders do you follow? Neil: Yes. Where I take my inspiration from now is just reading around the web whether it's from TechCrunch or Om Alex Personal Blog, or Mark Cuban's Blog, or Copyblogger or Moz. There's a lot of good content sites out there and just by reading and learning what other people are doing it actually inspires me quite a bit. Paul: Neil, listen I think we are coming to the end. I know you're really, really busy, so ... Do you have any thoughts for my tribe who are looking to build software businesses? Neil: Just go out there, do it and give it time. It's very rare to build a software company that does well within a year or two. It usually takes a few years before it really starts picking up but give it time. Paul: Listen Neil, I really appreciate you coming on the show. I found some of your insights really, really valuable and useful, the listeners on the show will find that too. Thanks a lot, I really appreciate it. Paul: If you enjoyed the show you can get the show notes from disruptware.com and if you are not a subscriber and you're listening to this in the iTunes store then please visit disruptware.com and sign up.